Acorn, buttercup, butternut, delicata, hubbard, spaghetti, turban—a bounty of colorful winter squash and pumpkins overflow grocery produce tables every fall. A fruit (really!) native to North America, and a member of the gourd family like melons and pumpkins, squash is super-easy to stir into hearty autumn soups. For a quick and easy squash soup, use fresh, canned, or frozen squash, or canned 100% pumpkin purée (not pumpkin pie mix, which includes sugar and spices) as the soup base. To prepare squash: If using fresh squash, peel a thin-skinned variety such as hubbard or butternut. Cut squash in half and use a large spoon to remove seeds and any fibers; cut squash into 2-inch (5 cm) chunks and set aside. Two 1-pound (.45 kg) squash will serve four people. If a squash is difficult to peel, or if you are using a different variety from the two above, use a small knife to poke a few holes in the squash; then bake at 350ºF (177ºC) for 40 minutes or microwave for 12 minutes before slicing. To make savory curried squash soup: Using a heavy 5.5-quart (5 L) pot, sauté 1/3 cup (53 g) diced yellow onion in 1 tablespoon (15 ml) olive oil until translucent (about 5 minutes). Add squash, 1 quart (951 ml) chicken or vegetable stock, and 2 cups (475 ml) water. Cook covered over medium heat until squash is soft and blends into stock. Add more stock to thin mixture, if desired. Add 1/2 tablespoon (3.15 g) curry powder (or to taste), salt and pepper to taste, and 1 cup (238 ml) half-and-half; stir to blend. Serve hot, but do not let soup boil after adding half-and-half. 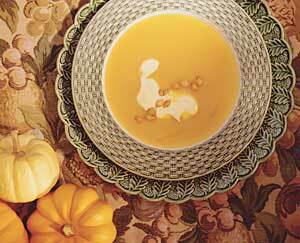 Mix it up: Try these other terrific squash and pumpkin soup recipes: Golden Harvest Soup, and Winter Vegetable Soup. Judith H. Dern, an independent writer living in Seattle, WA, loves vegetables and finds squash soup the perfect cold-weather dish.